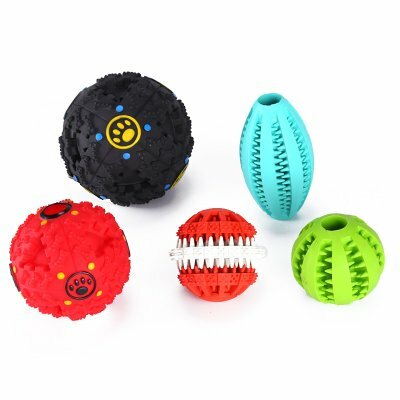 Successfully Added Dog Toys - 2 Treat Toys With Sound, 2 Teeth Cleaning Chew Toys, 1 Football Fetch Toy, Non Toxic Materials to your Shopping Cart. This set of durable dog toys includes two pet treat dispensing puzzles, a fetch football and two rubber chewing toys. They are all made from a non-toxic material and use an extra tough rubber that is designed to stand up to substantial chewing. This collection of dog toys provides interactive fun that will entertain and challenge any dog keeping them coming back for more time and time again. The two treat dispensing balls measure 4.7 inch and 3.5 inch in diameter so don't present any choking hazard. With a unique sound they will catch your pets attention as they roll and bounce across the floor. Each can be packed with treats, kibble or pet food so they offer a tasty reward as your dog learns how to dispense their prize. Dog games just got a whole lot bouncier. With an American football shape it is easy to throw and the springy rubber form makes sure it has a good bounce so is great fun for playing with your pet. This toy has carefully constructed edges that gives your dog plenty of chewing, biting and holding options. There is a a special melon scent that will make this an appealing toy for every pet. The chew toys are designed with raised surfaces that help clean your dogs teeth and massage their gums. These soft rubber toys provide a good cleaning action to reduct plaque and tarta buildup keeping your dogs teeth healthier. With a min flavor they will also help to freshen your dogs breath while offering them something better to focus on and chew other than your furniture. These dog toys comes with 12 months warranty, brought to you by the leader in pet products well as wholesale cool gadgets..